Western Reserve FFA chapter to hold benefit for Yaworsky on Dec. 10, 5-8 p.m., at the Western Reserve High School Auditeria, 3841 U.S. Route 20 E., Wakeman. 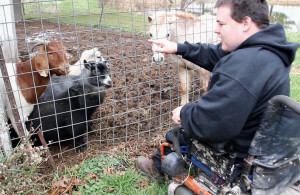 WAKEMAN, Ohio — As soon as his father helped him out of the car and into his power chair, Austin Yaworsky headed straight for the barn to check on his animals. Spinning his tires in the soft, wet earth as he rolled along, Yaworsky came face to face with a cream-colored pygmy goat on the wrong side of the fence. He immediately chased the escapee back to its pen. “That’s not even my goat,” he said. “Those are my sister’s.” His goat was the large Boer goat that popped its head out from inside the barn. “Anything that I raise has to have a purpose,” the teen said, explaining his Boer goat would eventually be sold for meat, unlike the pygmy goats his sister owns. After making sure the goat was securely in place, he makes his way to the chicken coop, again spinning his tires trying to get into position. This time he’s stuck. As he patiently waits for his father to come to his rescue, he explains how he ended up with the small flock of meat chickens. “I don’t know how I got talked into them,” he said, explaining a friend encouraged him to take them. With the ground wet from rain earlier in the week, Austin Yaworsky would get stuck several times trying to check on his animals the day I visited him. His father, John, was always close by to push him out. John Yaworsky trudges across the yard to free his son. After a couple minutes of pushing and spinning his tires, Austin is moving again — for now. He apologizes to his father for having to free him and, after tending to the chickens, Yaworsky speeds off to the next barn. Austin was born premature, at 32 weeks, said Angie Yaworsky, Austin’s mother. “He was born black and we didn’t think he was going to make it.” It turns out Austin was born with spastic diplegia, a form of cerebral palsy that affects his lower body. The Yaworsky family farms 110 acres of corn and beans in Huron County and owns a total of 155 acres. John Yaworsky’s father and uncle also farm grain and hay close by. As Austin rounds the corner to check the backside of the barn, he speeds up, hoping he will make it through the puddle ahead. He’s stopped short once again. Again, he apologizes to his father for having to come to his rescue, before peeking around the back of the barn to check on his cattle. “I trained my cow Betsy how to push me out when I get stuck,” said Austin. 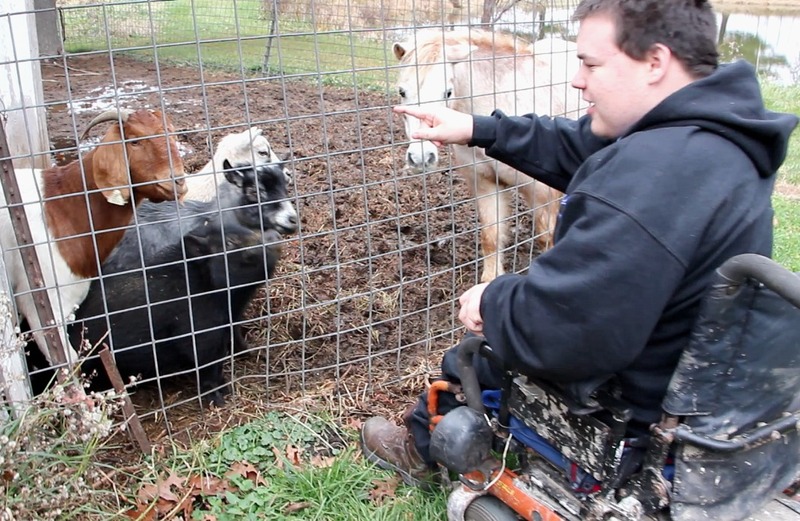 Tying calves to his wheelchair, he would halter break them. From then on, whenever Austin was out with his cattle, the heifer knew when to give him a push to keep him moving. Austin wheeled around the side of the barn to show me his Boer goat. He assured me that anything he raises has to have a purpose. 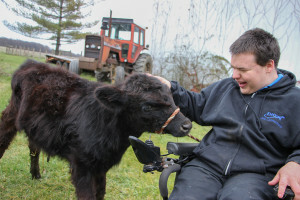 At 17, Austin has come to realize his disability would make it difficult to pursue grain farming, so the animals would be his connection to the farm. “We’ve never limited him,” said Angie. Austin started showing 4-H animals at age 10, and has shown rabbits, chickens, turkeys, miniature ponies, goats, pigs and beef cattle. He trained the rabbits, chickens and turkeys to sit at his feet on his power chair when he entered the show ring and then would ask the judge to hold and flip the animal over so he could answer questions about his animal. He wanted to take a feeder calf one year, so they reached out to John’s cousin, Nick Wagner, and his wife, Darlene, to help them get started. Nick and Darlene Wagner raise 60 head of registered black Angus cattle on their farm in Attica, Ohio. Austin showed a calf at the Lorain County Fair, winning reserve champion honors that year. “It’s something that he seems to be very interested in,” said Nick Wagner. With Wagner’s help, Austin pursued his own beef breeding project when he started the FFA program at Western Reserve High School, in Collins, Ohio. But Austin relies on the minds of his farming friends and family to help him when he has a question about farming. “I will continue to give Austin any help and advice I can,” said Wagner. After finding his cows were tucked away inside on this dreary afternoon, Austin spun his chair around to head back toward the house. Again, he faced the menacing puddle ahead of him and thought maybe this time he could trudge through on his own — almost, but not quite. Again, his dad came to the rescue and, again, Austin apologized. “It’s all right, Austin,” John Yaworsky would tell his son every time. Austin’s dream is to own an Action Trackchair that would make it easier to get around the farm. Originally designed for military veterans, the all-terrain wheelchair uses tracks instead of wheels and can move the operator from a sitting to a standing position. Yaworsky and his parents feel the chair would help him maneuver around the farm, as well as give him a better state of mind. Micayla Finchum, a senior at Western Reserve High School and FFA chapter president, has been Yaworsky’s classmate since kindergarten. She’s heading up a chapter spaghetti dinner benefit Dec. 10 that will help raise funds for Austin to get a Action Trackchair. Yaworsky has participated in numerous FFA events, from soil judging to livestock judging, with the help of his classmates. His first two years of high school, a couple of older, stronger boys would carry Yaworsky down into the soil pit so he could judge the soil, explained Angie. As he got older and those stronger boys graduated, Austin would roll his chair to the edge of the pit and ask a fellow student to bring him samples. 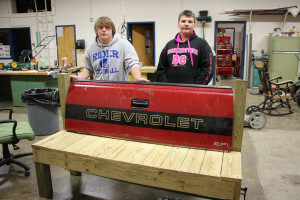 For the past two years, Yaworsky has been a student at the Erie, Huron, Ottawa Vocational Education (EHOVE) Career Center. “I can’t read or write too well, so I know it’s where I need to be, but I miss my friends (at Western Reserve),” said Austin. But that hasn’t stopped him from being a part of the FFA chapter activities and meetings, said Finchum. “Austin has a phenomenal willingness to learn,” said Mark Starkey, Western Reserve FFA adviser. Wesley Breedlove (left), a freshman at Western Reserve High School, volunteered his time after school to put together this tailgate bench that will be auctioned off during the benefit. David Finchum, freshman, assists. While he has only been at the high school for a year, Starkey has already seen Yaworsky’s character. “I have a tractor I brought into the shop to restore,” said Starkey. Austin immediately began asking how he could help. The Austin Yaworsky Spaghetti Dinner benefit is Dec. 10, 5-8 p.m., at the Western Reserve High School Auditeria, 3841 U.S. Route 20 E., Wakeman. About this time in the afternoon, Austin’s little brother Justin, 8, gets off the school bus and runs to greet his brother. “Hi buddy,” says Justin, tossing Austin his backpack. Justin enjoys helping Austin out around the farm and Angie believes he shares his big brother’s passion for the animals. “I’m the brains of the operation; he’s the legs,” said Austin, as his brother runs off to help their parents halter a calf. While Austin and his family know he is limited, and Austin knows he won’t be able to do everything without a little help, he also knows he wants to carry on the farming tradition. John and Angie purchased a second farm with 10 acres of pastureland — which they intend to expand to 20 acres — for Austin to expand his herd. “My dream is to make the farm depend on itself,” said Austin. And he’s determined to power through any of life’s “mud holes” to make that happen. 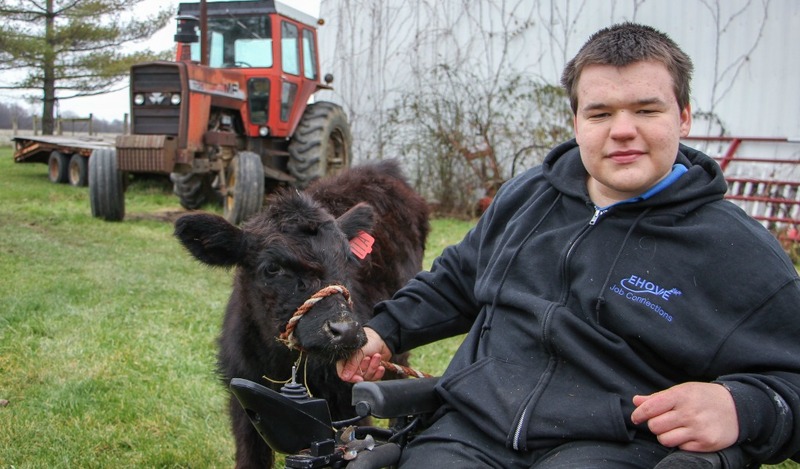 17-year-old Austin Yaworsky has come to realize his disability would make it difficult to pursue grain farming, so the animals are his connection to the farm. Pictured here, with his steer, Steak, Austin’s dream is to get an Action Trackchair to help him get around the family farm better. 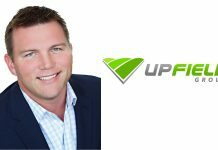 Can’t attend the benefit but want to help out? If you would like to donate to Austin’s cause, you can mail donations to: Western Reserve FFA Alumni, Attn: Mark Starkey, 3841 U.S. Route 20 E., Collins, OH 44826, or contact Rebecca Beck at becks5@accsandusky.com. Austin’s 4-H club set up a gofundme page to help Austin reach his goal of attaining an Action Trackchair. 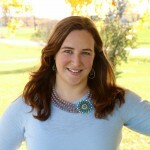 Visit https://www.gofundme.com/2jujk24 for more information. 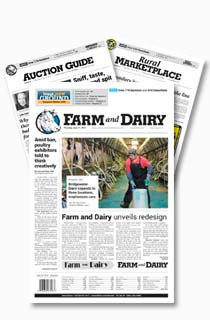 Previous articleHow does liability insurance work on the farm? 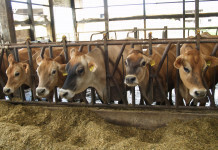 My husband is a paraplegic and has continued to work on his family’s dairy farm in spite of his injury. He operates many of the tractors by using hand controls (some bought, some made), and he gets around the farm using a cart like shown on the website below. It may be a helpful vehicle for Austin as well.